Behind the Bit: Padre in Person! Some of you know that Padre, the mustang that won big at Dressage At Devon a few years ago, will be at the Equine Affaire in Massachusetts this weekend. Patti called me a few months ago to say she would be travelling through PA on their way there -- could we meet? I've been like a kid waiting for Christmas ever since. While I'd only corresponded with Patti via email, she's one of those people that you feel you know before you meet her, and my feeling was right. She's fun, low-key, and totally committed to her special horse. So I met Padre and had dinner with Patti Brutus and Sandy, the third part of the Padre triumvarate. Sandy is the barn owner and supporter/backup on all of Padre's excursions. 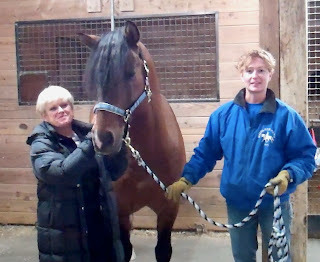 Padre is as lovely in person as in pictures, and Patti has some exciting news for Padre fans -- see the video!!! the video says it is private. Oops, when I click on the video, it says, "This video is private" and won't play! Not fixed.... And I've been anxiously waiting for this news since you hinted at it on facebook! Neat photos... he's so cool! He is lovely!!! So glad she kept him a stallion! Not only does he represent Mustangs fabulously, he also shows how well-behaved stallions can be haha! I can't wait for the book to come out, it would make a lovely gift to the lesson kiddos at the barn. Too bad I'm selling all of my Breyers, because then I would get his model too! He is wonderful! I knew a mustang mare back in the 1990s who was built similar to him. She was a little shorter and perhaps a tiny bit stockier but definitely more of the Spanish style mustang. Does he have any babies on the ground? Oh, such exciting news!! He was such a logical candidate for a statue but you just never know. Thanks for the great look at the handsome guy. What a gentleman! Yay Padre! I absolutely love him, Mustangs are my second-favorite breed and he is SUCH a good representative for what they can be! How lovely that you got to meet up with all of them... And I love the fact that he's sponsored by the Peeps peeps! Wow, what a nice interview! Lucky you to meet Padra and what a gentleman he is. Great news about the book and Breyer. That is way cool! Oh, he is so beautiful! I love the dorsal, and his face...too much! I am in LOVE with those ears! He is so gorgeous. I also love that as soon as she started mentioning treats he started nudging around in her pocket - what a smartie pants! I love his expression! :) He's adorable. How cool you got to meet both of them! I am so jealous! As a mustang owner, I definitely look up to Patty and Padre. He has been such a great ambassador for the breed. And Patty is just insanely talented. I am so in love. He is so beautiful! I enjoy following him on FB, too. What an absolutely gorgeous gentleman. Thank you for sharing this special interview!